Collins and Greig | Service is our only product! After 70 years, 1000's of customers, and millions of kilometers, we're still family owned, and still putting service first. Collins & Greig is a family owned and operated moving and transportation company, servicing the specialized delivery needs of our many valued customers throughout the Greater Toronto area with a wealth of experience in the cartage and household goods business. Established in 1947 by A.J. Greig, we are celebrating our 65th anniversary in 2012, a testament to our business philosophy of building long-term relationships with our customers, and practicing daily our company mandate, which is emblazoned on all our trucks - "Service is our only product!" Whether you are moving across the street, cross-town, another city, or even to another country, it is Collins & Greig’s intention to make your transition to your new home a smooth one. As an agent for Atlas Canada, one of the country’s largest and successful van lines, Collins & Greig will tailor your move to meet your individual needs and requirements. For over 60 years, Collins & Greig's ownership and management group have taken a hands on approach to providing personal service and ‘earning the trust’ of their customers on a daily basis. Combined with Atlas Canada, we offer the following complement of services to meet your moving requirements. Collins & Greig has been committed to providing reliable, professional and economical transportation solutions for over six decades. With a head office located in Toronto, Ontario, close to all major regional highways, Collins & Greig has built their successful freight division by establishing successful, and prosperous working relationships with their customer base, and by offering a variety of transportation services. Collins & Greig has more than 30,000 square feet of household and commercial storage needs, with 24-hour security monitoring. Our warehousing units are ideal for mattresses, appliances and new products direct from the manufacturer. 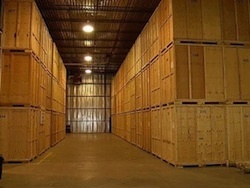 We also offer containerized and climate controlled storage facilities and offer inventory control services when necessary.